It’s nearly 1am and I am sat in my tent listening to sand being blasted against the walls. I am absolutely zonked. Having cycled thousands of miles across Eurasia I am fit but my body isn’t used to paddling. My shoulders feel like cement, my hands are blistered and my back squeals regularly. The transition from Hercules to Nelson has been gruelling for both mind and body, and I am only three days in. Originally the plan was to cycle further North up the Russian coast to the old fishing village of Lazarev, but after Hercules’ bearings disintegrated 150km South at the little town of De Kastri, there was nothing to be done but get in the boat and go for a longer crossing to Sakhalin. Lazarev would have meant a few miles of open water, but the section of the Tatar Strait that Justine and I paddled yesterday was 23 nautical miles, with a few extra tagged on at the beginning. The wind was stronger than forecast (gusting 20knots from NW and N) and roughed the shallow sea up into some really challenging conditions. For the first two hours I was not a happy chicken and it was all I could do to concentrate on staying upright, my mind boggled at being back in a boat (much to my frustration) and my body rebelling painfully. Justine had given me the option to head on up the coast a short way in the hope that conditions would be more favourable the next day but I knew that the landing on the other side at that point would be lots of shallow sand banks and rather messy. Inside I also knew that some rough stuff would be good practice for the more difficult La Perouse Strait in a couple of weeks. I said that yes, I wanted to go and have a shot at the big crossing. And I am glad I did. After a really challenging slog and over 8 hours in the boat, we landed on the remote island of Sakhalin. As you can see from the video that Justine has just edited in her tent after today’s paddle, my legs weren’t very good at all that time sitting down! We are now heading South for another 2 -3 days, depending on the weather (currently a strong headwind). PS Getting Nelson out to Russia was a gargantuan task, so a huge thank you to the guys at DHL for all their hard work in making it happen. PPS Some wonderful wildlife out here. Eagles soaring, seals snoozing in the sea or on the sand and brown bears, apparently. No sightings of the latter yet though we did see foot prints in the sand today. Must have been a huge beast. Surf crashes into the beach less than 100 metres away. Okay you are an inspiration to us Baldwin’s. Louise & I sat here and watched the video! You guys are the GREATEST!!! Superb stuff girls. Many thanks for keeping us updated so well as usual. Great to see. You are looking sooooooo good. Superb filming by Justine too. Do you get a wee rest now whilst Herc gets repaired?????? What happens next??????? Sarah, myself and my tutor group check out your progress most days. We all think you are amazing. Great to see Nelson in action we were sorry to hear about Hercules. The students have been given a challenge to design things for your bike, boat and canoe. I can not wait to see what they come up with. During tutor time we sometimes cover most of the curriculum through using your website. It is a fabulous teaching aid. Well done so far and good luck. well done sarah! wonderful stuff….even your ‘forced’ smiles are amazing! What a credit you are, so glad you arrived safely and also the fact the Hercules is getting sorted out. Hope that you will be able to rest and recharge for a little while. Do take care and have a gret time on the next part. Wow, really don’t understand how it is possible to be in the water in such a small kayak (a boat for me) for hours?! How to navigate? Where to swim? 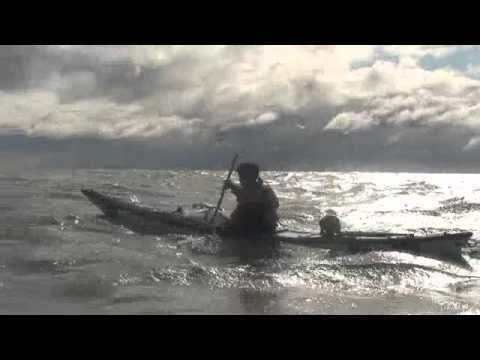 Anyways, really inspirational advernture and I really want to try kayaking when I am in UK or in Sakhalin. Brilliant video, I can feel the waves and power of the sea. Many thanks to both of you for what you are doing! Be sure to keep food and food smells out of the tent. Do you have bear canisters? Any good trees to hang food in? Be Careful and have fun. Sarah didn’t use bear cannisters, we just kept food and the kitchen area away from the tents. Camping by roads with the regular noise of traffic should also have helped keep bears away. She also carried loud flares to scare any that came close and a type of pepper spray if they came really close. We’re keeping upto date with your progress here at the Junior School. Brilliant that you are already on Sakhalin. Superb video. It’s fantastic to be able to follow your progress like this. Nice bit of filming and editing by Justine. The water looked a bit rough. Glad you both made it. Now have a rest. God bless. Peter Nottingham. I’ve enjoyed following your adventure these past few months and I’m quite impressed with you! Congratulations on your successful crossing and I look forward to reading more about your amazing adventures since you are such an amazing young woman and an inspiration to us all. On another note…I have a have a personal question for you that will help me with one of my adventures next summer. I plan on competing in a local 23mile kayak circumvention and I noticed you were wearing a dry suit & I know the kokatat dry suit are the best on the market and have a handy back zip for women but even with the accessibility how did you go to the bathroom in a kayak in the open ocean? Any tip/advice would be greatly appreciated since I’ll be facing the same challenge next summer. Oh dear, Michele, this might be one of the few questions for which I’m not qualified to answer! I have a feeling that it may involve some careful balancing but I will pass this one on to Sarah and Justine once they are back on dry land. Thanks for the note. Peeing from the kayak is superlatively awkward and I have no idea how I would manage if I paddled solo! The back zip can be pretty stiff, so first up, make sure you wax it regularly to keep it running cleanly. Paddling with a partner means that we raft up, the one going to the loo gets out of the cockpit and balances one leg on each boat – I tend to do one leg kneeling on the back of Justine’s deck and the other foot in my cockpit. Then you crouch, unzip and go for it. My advice would be don’t go for the Kokatat power dry fleecy liner – the zip runs front to back and is quite awkward. I have been wearing one because it is so warm but tend to leave it unzipped to make it easier. Trousers and a top would be much easier! I have heard of some ladies using ‘Shewees’ or similar – I find I make more of a mess with those so tend not to. It may make sense for you if you are solo though. Or indeed a plastic milk bottle chopped in two with a wide open end? For the K1 racing I did a few years ago where the mileages were shorter and you are in and out of boats and getting wet all the time anyway, the status quo is just to pee in your boat. Though being in a dry suit you DO NOT want to do that unless there is no other option. Great work! The kayaking will feel so much easier from here on. So glad you are not so exhausted that you are not seeing the wildlife in these remote areas. Must be amazing!! Keep an eye out for those bears though!! The sort of animal that is good to see from a distance!!! Do you think you are seeing Steppe eagles? Your joy at reaching Sakhalin was great to watch Sarah. You euphoric state made me smile (and well up a little). I have nothing but total admiration for your endeavours.